What's your favorite anime opening? Ending? Chances are, you love it for the music, the action, or maybe for the fact that it changes and evolves as the series progresses. But we're here to celebrate a different kind of anime OPs and EDs: the kind that leave you completely and thoroughly disturbed. Whether it's the animation or the music (or the combination of both), these anime endings and openings are some of the creepiest you'll ever see. The upbeat pace of the Mirai Nikki opening song makes the intro more thrilling than creepy, but the images used set a different tone. Selective use of colors, dark scenes and imagery, and plenty of bright red blood create an atmosphere of unease. The haunting melody of Elfen Lied's opening is hard to forget once you've heard it. It was written by MOKA using parts of the Bible and an old hymn, and is sung beautifully in Latin by Kumiko Noma. While the music fills you with awe and dread, the opening scrolls through mostly-still images that pay homage to Austrian artist Gustav Klimt. They feature some of Klimt's famous works, with the series' characters painted into them. The imagery and the song are both the kind that stay with you long after you've finished the anime. Muct of Serial Experiments Lain is strange and mildly disturbing. The opening song is a mellow one, performed in English. The words, taken in context with the show, relate to Lain's transformation and growing understanding of the world around her. Even without listening to the words, the sound of the music fits in with the overall tone of the anime. The intro shows staticky images of Lain watching people through computer and TV screens, walking through real life photos, and walking through a eerily abandoned city where time seems frozen still. What could possibly be creepy about people smiling? Paranoia Agent turns something benign into a creep-fest with its unsettling parade of laughing faces. Just standing in odd locations, laughing. The song choice is not exactly normal either - but then again, when has Satoshi Kon done anything "normal"? Psychological anime like to mess with your head right off the bat. Ergo Proxy does this wonderfully, opening with some strange mashups and imagery set to English soft rock vocals. The images that flash during the opening mix live photography with symbolic shots, combined with grunge overlays. It's dark and choppy, and leaves you feeling like something just happened that was bigger than you realize. Monster is a one-of-a-kind psychological horror anime that probably needs no introduction. Its opening places you in the protagonist's shoes, showing his state of mind and making you feel like maybe you should always be looking over your shoulder. Like the anime itself, the opening is slow-paced and seemingly not much happens, but it's impressively tense for something that's just under a minute and a half. The final images play with point of view shots, and prime your mind for whatever psychological horror is coming up in the episode. The ending deserves a mention here too, for its haunting English vocals and the art: a child's drawing that evolves over the episodes to tell a story. Hearing that song begin after the horrors of whatever episode you just watched never fails to be unsettling. 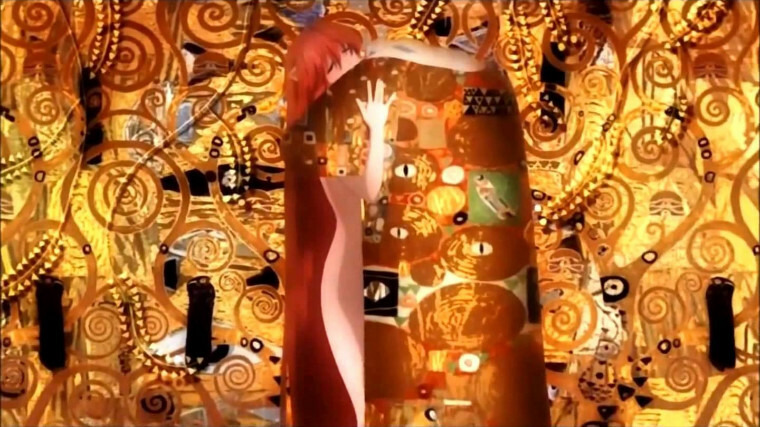 In this opening, the protagonist wanders around, over, and upside down through a background that's a trippy kaleidoscope of shapes and colors that combine to form images of the show's characters. It might not have made it on this list if it weren't for the music: a haunting song about karma and the feeling that your life is going through a loop of doing the same things again and again -- and ending with a plea for karma to end this repetitive life with its own hands. Many of the anime that have creepy openings are from the horror or thriller genre. Zetsubou Sensei is neither of these -- it's a cultural satire told through a slice of life full of dark humor -- but the openings never fail to disturb. In this version of the opening, we're presented with a very distinct and weird style, a seemingly absurd song, and some creepy staring girls. It also manages to have nearly nothing to do with the actual anime. And this is only one of the show's strange openings. For its ending theme, Dantalian no Shoka ditches the pretty Victorian-setting animation, and goes full weird. The ending shows an old-style black and white live action film of a girl in a strange outfit dragging a truck through a forest of trees, growth, and -- for some reason -- keys. The film puts together carnival themes, and shows strange flip-book shots of some creepy masks, marionettes, what appears to be a demonic carousel, and other images that create an unsettling feeling. All of this is set to the sound of a clear-voiced woman singing to violin music, which ends in a girl's whisper and an unexpected rock riff. It all feels like something you'd watch at an indie avant-garde film exhibition, not at the end of an anime. Just try listening to that ending theme without getting goosebumps. More word art than song, this poem-like ending theme tells the story of a flower that has freshly bloomed… told with a demonic undertone. The music is minimal, and the words themselves are performed in a halting, eerie way that puts your hairs on end. In this anime ending, Kanon puts her amazing cello skills to great use. The beautiful and deep cello music, combined with the carnival-like music played over it, and Kanon's great vocals create a wonderfully unsettling atmosphere. The image of a lifeless doll-like character, and the subsequent dancing scene also add plenty of unease to the ending. If you've gotten to the end of even one episode of Madoka Magica, you know this is not your ordinary magical girl anime. Despite this, the ending still manages to leave a mark. Colored flickering silhouettes are shown as Madoka walks past her friends, runs into darkness, and appears in the middle of an eye. If you listen to the song, the lyrics only add to the tone, speaking of the power to save the world by waking up from your dream. If there ever was a fitting way to see out an episode of Madoka Magica, this is it. No matter how awesome an anime's opening and ending songs are, you probably start skipping them after the 2nd episode. But don't skip ahead just yet - these 11 anime openings and endings change over time. Watch closely, now!